Excess Tissue. A gummy smile can be caused by excessive gum tissue covering more of the enamel surface of a tooth's crown (visible portion) than normal. 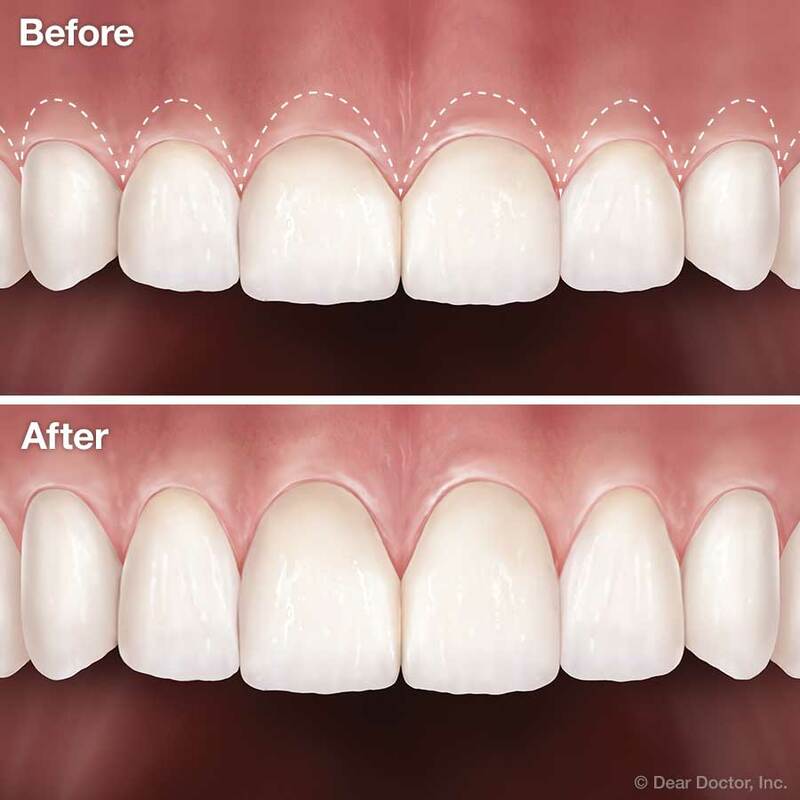 If that is the case, a procedure known as “crown lengthening” can be performed, in which gum tissue (and sometimes a small amount of bone tissue) is removed to expose more tooth surface. Receding Gums. Sometimes your gums can shrink down (recede), exposing a portion of your tooth roots. This causes a cosmetic problem because root surfaces, which have no enamel covering, tend to appear more yellow than the crowns of your teeth. Also, exposed roots can be more sensitive to cold or touch, and can be at greater risk of decay. There are various gum-grafting procedures that can cover exposed roots, which may involve moving gingival (gum) tissue from one site in the mouth to another. For example, roots can be covered with tissue from the roof of your mouth, which is of the same type; or adjacent (nearby) tissue can be moved over to cover an exposed root. Sometimes laboratory-processed tissue from another donor can be used instead of your own tissue. All of these options can be discussed with you in more detail. Gum tissue grafts will have two sites that need to heal: the donor site from which the tissue was taken, and the recipient site where the tissue was attached. Both of these sites will require stitches, usually of the dissolving type. You will need to eat a softer diet and avoid chewing on that side of your mouth for a few days. Though full healing may take a few weeks, you will be able to resume your normal activities the very next day. Whichever kind of cosmetic gum surgery you may need, the procedures are routine and predictable — and they can do wonders for your smile! Natalie J. Stelzer, D.M.D. & Associates (Cedar Springs), P.S.C.